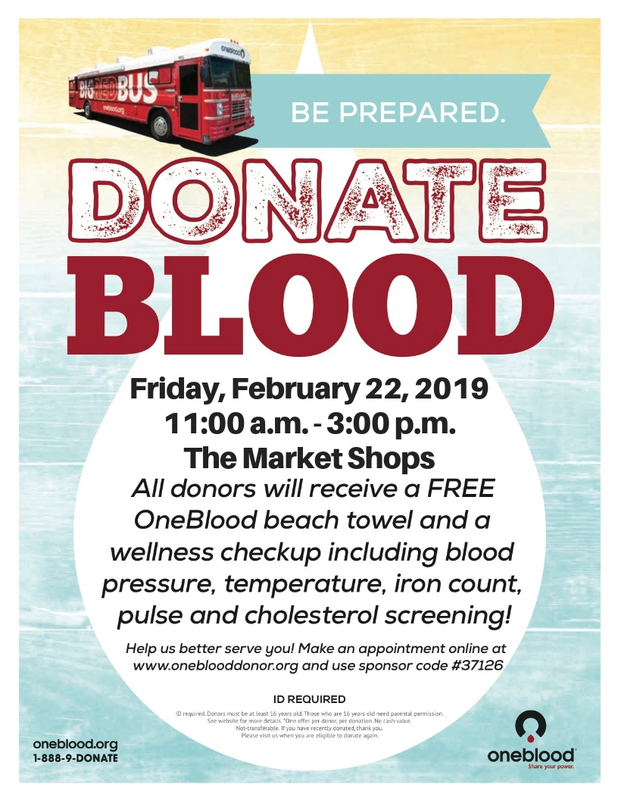 The Market Shops will host the OneBlood Drive on Friday, February 22, from 11 a.m. to 3 p.m. Following the success of the 2018 drives, which saw an impressive number of donors, The Market Shops plans to continue these on a quarterly basis. The OneBlood Big Red Bus® will be parked in The Market Shops parking lot, adjacent to Highway 98. OneBlood is a not-for-profit 501(c)(3) community asset responsible for providing safe, available and affordable blood. Generally healthy people ages 16 or older who weigh at least 110 pounds can donate blood. Photo ID is required. All donors receive a wellness checkup of blood pressure, pulse, temperature and iron count, including cholesterol screening. Donors will also receive a OneBlood t-shirt and a kid’s scoop of ice cream from Ben & Jerry’s in The Market Shops. One in three people will need blood in their lifetime. Blood that is donated on February 22 will likely be transfused within two to three days. The turn-around is that fast, the need is constant. Many potential blood donors believe that they cannot donate blood due to medical or other reasons. If you are curious if you are a candidate for donation or to learn more about the importance of blood donation and how donors can target the power of their blood type, visit oneblood.org.